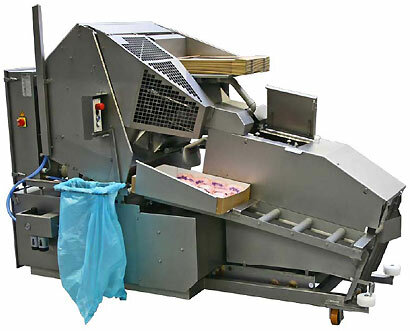 This packaging machine is an automatic chicken packaging machine for both frozen and fresh end products. The machine has been designed and built for ultimate reliability and minimal maintenance. All parts are made of stainless steel or high quality synthetic material. All sensitive components are well shielded, so the entire machine can be cleaned with high pressure. A realistic output for a manual fed packaging machine is approx. 800 birds/h, in combination with a feedlink unit it can go up to 1,100 birds/h. The output depends on the local conditions, such as bag and tape quality, and the organization around the machine.